Rhizomania, is caused by the beet necrotic yellow vein virus (BNYVV), which had been classified as a furovirus. BNYVV is transmitted by the soil-borne plasmodiophorid-like fungus Polymyxa betae, which is an obligate parasite – requires a suitable host to complete its life-cycle – infecting members of the beet family, Amaranthaceae. The viral pathogen survives in long-lived survival structures of the fungal vector called cystosori. 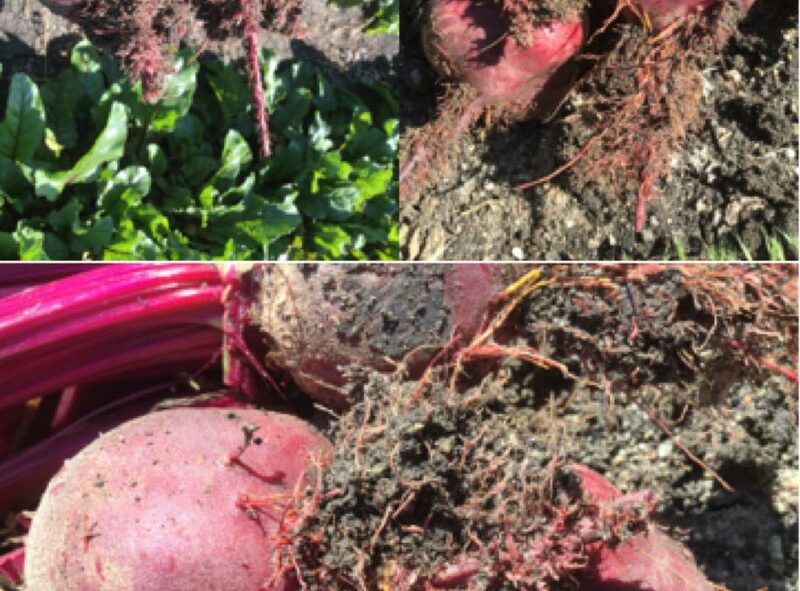 The cystosori liberate zoospores that infect beetroot, and if viruliferous, will transmit the virus into the roots. Leaf symptoms may consist of variable degrees of chlorosis (yellowing). As a result of systemic infection, in addition to leaf yellowing – veinal necrosis, crinkling, wilting and stunting of leaves may also be observed, which may often be confused with a nutritional deficiency and/or water stress. Rhizomania is characterised by a constricted taproot with the formation and proliferation of small lateral, fibrous, feeder/hairy roots, giving the storage root a beard-like appearance, known as bearding or Rhizomania, which is the Greek term for “crazy root” or “root madness”. The copious amounts of lateral hairy roots formed on the taproot will limit the amount/efficiency of nutrient and water uptake, resulting in a stunted growth and reduced yield. Because of the zoosporic nature of the fungal vector, warm, water-saturated soils are required for effective dispersal and infection. Early infection results in a significantly higher degree of stunting and yield reductions. Infections occurring later in the growing season may suffer loss of sucrose content, but often result in acceptable root yields. Thus, the severity of yield losses is directly correlated to the time of infection. Using of Rhizomania/BNYVV tolerant, F1 hybrid cultivars is the most import and effective means of control. However, unfortunately some recent evidence suggests that some populations of the pathogen may be overcoming the resistance in these cultivars. Seed of Rhizomania/BNYVV tolerant F1 hybrid varieties are also very expensive. Avoid spreading of infested soil. Early sowings when soil temperatures are still cool, precise irrigation, proper soil drainage and the establishment of a vigorous leaf canopy, may reduce the risk of infection. Crop rotation as a precaution – it is important to note that once a field is infested with Polymyxa betae, crop rotation may not be effective in reducing the risk of infection, due to the dormant spores in the soil.